-Woah! Deanna's bun is CRAZY in this one. It literally stays right there through the entire episode. -Aw. Beverly and Picard. So many sighs. -This is a planet where people have crazy tournaments over who gets to be "First One." -I think I remember Patrick Stewart mentioning this one as being, "very silly." I tend to agree. Though, this episode isn't without its merits. I love seeing Tasha Yar execute that killer Judo throw. 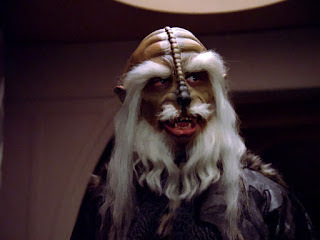 -Although the Ferengi were mentioned in "Encounter at Farpoint," we don't see them until this episode. I love how much we get of them later (especially in DS9) so it's fun to watch them here, in their early stages. -Lots of comments about Starfleet making the females wear clothes. -This feels a lot like a TOS episode. -Yes! The Traveler! I love this guy. -For a few moments, I wondered who would win in a fight between Q and The Traveler. Then I realized it was obviously Q. The Traveler needs help from poor Wesley. -Also, I love how Wesley's super-specialness is already hinted at way back here in the very first season. Nice job, TNG. -I must have seen this episode at least four or five times but every, single time it comes on, I spend about five minutes thinking I've never seen it. Then the rat-face guys come on and I go, "Oh yeah, the Dark Crystal episode." 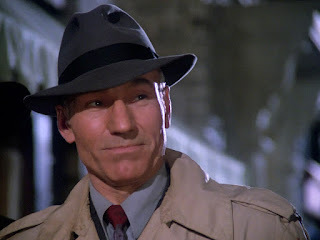 -This is also the first "Data is Sherlock Holmes" episode. He's even smoking a pipe. -This is the episode wherein Wesley is condemned to death for falling into some flowers. -It sure seems like they were trying to set up the Ferengi as a main baddie species for TNG but it just didn't work out that way. They ended up becoming more of a joke. -Ok, this episode is basically wall-to-wall Shakespeare quotes. I'd say maybe a quarter of the total dialogue in this episode comes straight from ole' Bill. Pretty awesome. -So, this is Deanna's almost-wedding-episode. It's actually pretty sweet and has a lot of heart. 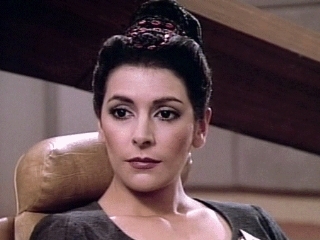 -Also, this is Lwaxana (bonus points for not having to look up the spelling of her name) Troi's first appearance. -DIXON HILL!!! Actually, I'm not super into this episode but I still get that it was a big deal for the show. Also, Picard looks 100% dashing in his outfit. -Oh boy. These guys are in for a treat. -They have no clue who Lore is. Watching this feels like what it must be like to go back in time and watch the Titanic sink. You know that ice berg is going to be a big problem but there's nothing you can do to warn them. I watched the Star Trek episode of Futurama last night and thought of you!